Yes I will buy this! Do we know anything about it yet? Not excited about the external look, but what's inside is what matters. They will be announcing more about it soon. This is it, folks! Finally unveiled! Looks like it has a stills button. The BMD press conference is starting up. Live, on YT. Look at this pic for facts and price! Hand held digital film camera with full 4/3 HDR sensor, dual native ISO up to 25600. MFT lens mount and 13 stops of dynamic range. Features 5 inch touch screen, internal SD/UHS II and CFast 2.0 card recorders plus also records directly to any external USB-C disk. I knew there was a catch! September release date! Crap. Here's an interview that just came out. I'm imagining the reporter is wrong about M4/3. The sign says full 4/3. 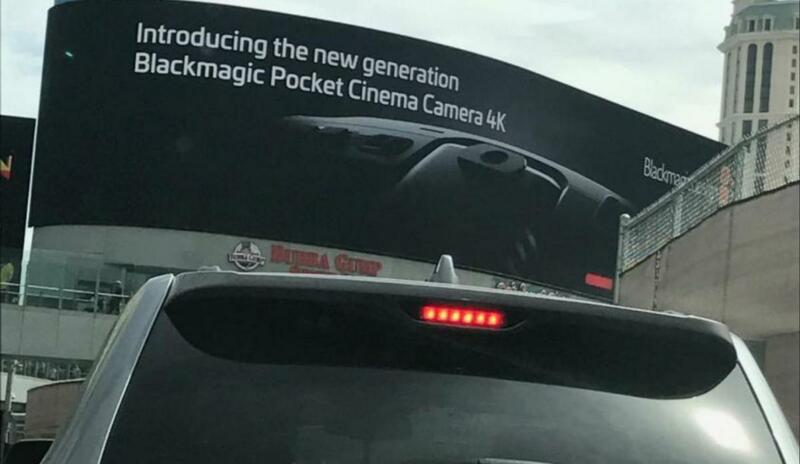 Unlike its HD-only predecessor, the Blackmagic Design Pocket Cinema Camera, the new 4K version shoots full cinema 4K (4096 x 2160 pixels) at up-to 60fps with a newly designed M4/3 (21.60 x 17.30mm) sensor. You’ll also be able to capture full HD 120 fps cropped (no info on how much of a crop) slow motion in both 12-bit CinemaDNG RAW and 10-bit Apple ProRes 422 (HQ) varieties. Unfortunately you won’t be able to shoot in the newly announced Pro Res RAW — at least not yet. The company promises a significant performance increase when it comes to low light capabilities and the camera tops out at 25,600 ISO, though time will tell how high you’ll be able to crank the cameras dual native ISO and still achieve “pro-level” shots. You can record to two slots using SD/UHS-II and CFast cards (they’ll switch over mid-recording if the second slot is fast enough) or record directly to an external drive through USB-C. The camera features a 5-inch LCD touchscreen (see above photo) that takes up nearly all of the real estate on the back of the body. 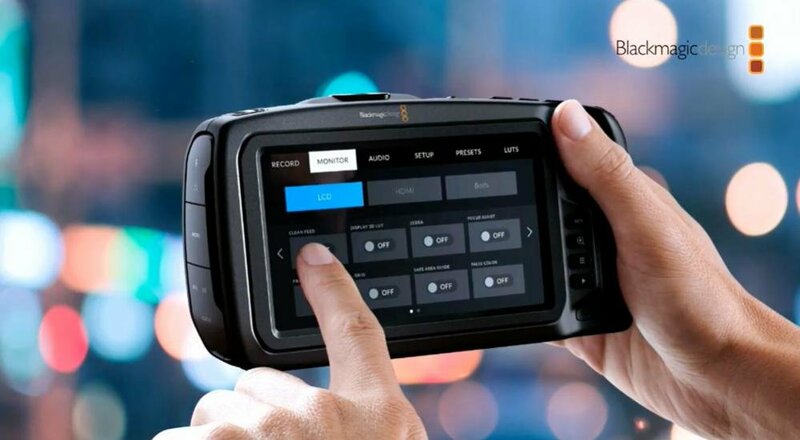 URSA owners will find the menu system familiar as the pocket 4K runs on the URSA operating system. The camera uses the same lens mount as the original pocket allowing for EF, PL or C mounts to be used with an adapter. It may no longer truly be “pocket sized”, but the carbon fiber polycarbonate composite body feels solid to the touch. “Function” buttons on the upper right of the body are all customizable and you’ll be able to map your favorite tools (such as peaking, waveform etc.) to these keys. A high frame rate button on the back also lets you jump right to high speed modes quickly. 1/4″-20 holes are available on the top and bottom of the camera for accessory and tripod mounting. 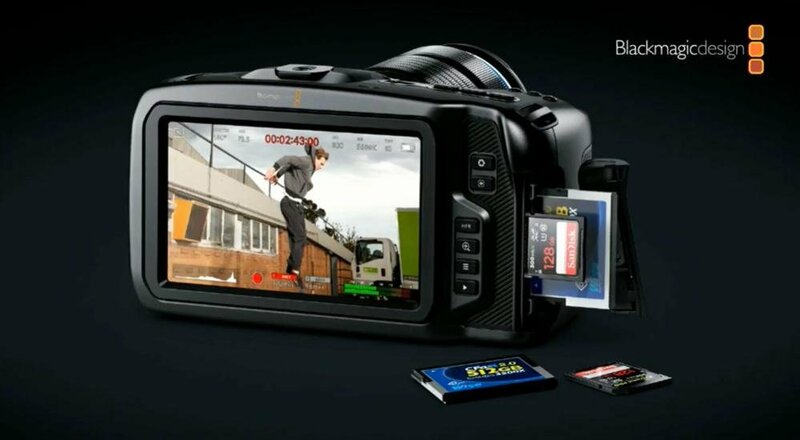 Notably, the camera is powered through the popular Canon LP-E6N batteries and not the Blackmagic lithium ion branded batteries of yesteryear. Another interesting power feature: when you remove the battery the camera will automatically safely power down and will power itself up once a new battery is inserted in the battery compartment. No intimidating warning message. The camera has four internal microphones and a mini xlr audio port for using your favorite external microphone system. You can also power that external mic through provided phantom power. This isn’t the only NAB 2018 news out of Blackmagic Design — the company has announced a significant update to Da Vinci Resolve which we’ll cover in a separate article and video interview with Grant Petty. While it is unfortunately not shipping until September the price point of $1,295.00 keeps the pocket 4K camera in a category of its own and being able to shoot RAW 4K potentially makes the camera an excellent successor to its HD little cousin. We’ll reserve judgement until we are able to do a full field review, but on paper the camera shows a great deal of potential. So far my big complaint is 4/3rds sensor and looks rather pain to get a HDMI locked cable in there. Yea umm forget about the URSA mini pro for now haha!! I will be nabbing this fo sho!!! With FREE Resolve Studio 15 at $1295 this has far exceeded any of my expectations and I will 100% be buying it. 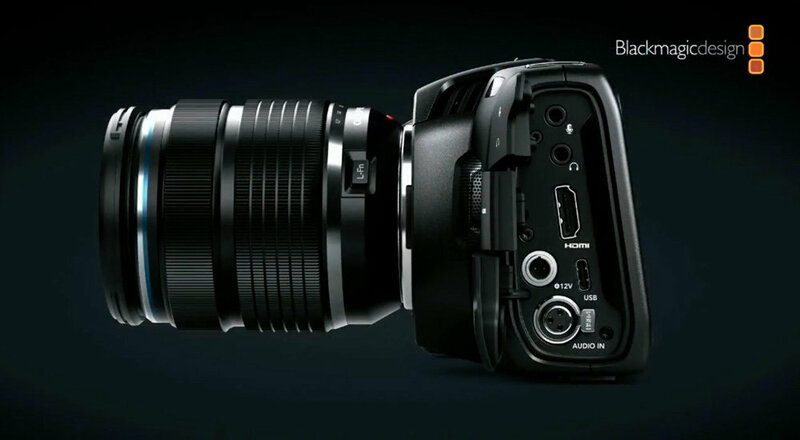 Grant said it is "basically the Ursa Mini Pro" in different form/sensor. This camera will kill all other cameras in its class. My only complaint is the lack of a flipscreen. That's all. Just remember, it won't be out until September. It's a LONG wait. If the Canon C300 Mark II or the C200 go down in price I'lll be buying one of those. Does BMD have a history of delaying their releases? I've been looking at digital options beyond my Canon T3i but still within my limited budget. I think by September my 401k will be _down_ to around $1250. It won't be enough to fund a retirement but will be enough to allow me to run away from the home with a new camera and a smile. Jesus Christ they have single-handedly ended the entire "budget 4k" race. ...I expect this to release with a million bugs though. The First Look videos are coming in. This thing is definitely the big hit of the year at NAB. This makes me happy. Frankly, I love the micro 4/3 sensor - makes me less concerned about low light issues with a 4k sensor. Plus, all of my lenses can be adapted for m4/3. Since I'm mostly a m4/3 shooter now, it means that very little will change for me. Frankly, I'm willing to bet this camera is using the same sensor as the GH5s - that makes the most sense to me. I mean, we have dual native ISO, CinemaDNG RAW, multiple recording options (SD, cFast, USB), professional audio input, full sized HDMI (I find a need for a 'lock' on full sized ports pointless for the most part). Plus, you get a full copy of the new Resolve Studio, which integrates Fusion into the package - so the camera ends up being $1,000. Considering they deliver on their promised features, and they understand the demand in advance to prevent huge backorders - they have a hit on their hands. 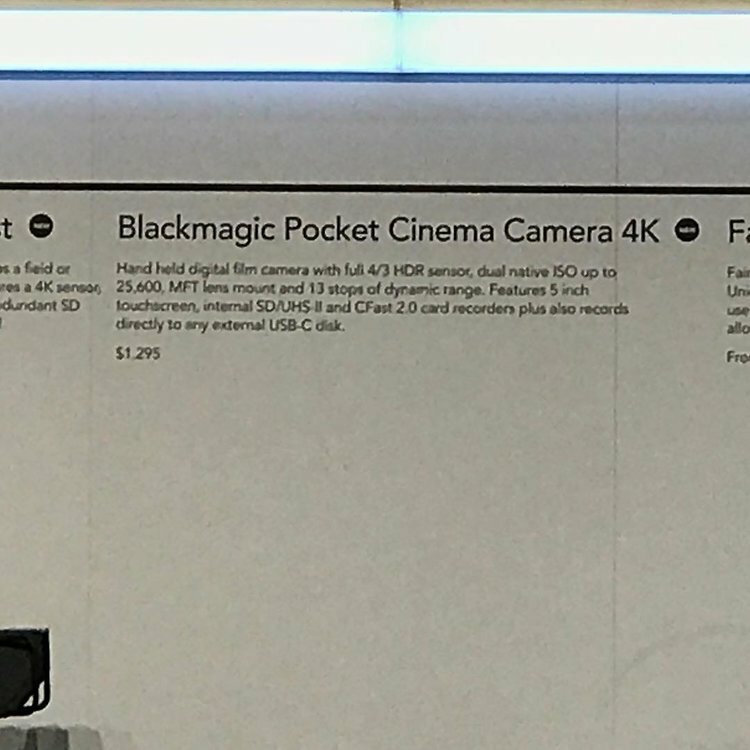 As for its looks - its certainly not a real 'pocket' camera, but then again you can't pack these features into a pocket-sized camera. I'd rather have a little larger feature packed camera than a tiny camera with lackluster inputs, tiny screen, etc. It does look about the same size as a small DSLR, which is still discrete and small enough to stow in a bigger pocket. Looking at it, it looks kinda like a futuristic consumer DSLR, which will certainly help when trying to not draw attention to yourself. I placed my preorder for 2 of them with BH around 3pm. Something tells me the demand will be big for these, so if you want one in a reasonable amount of time, I'd get a preorder in ASAP. I'd pre-order it, but I have no idea where I will be on September 3rd. Still no SDI port for monitoring (not even mini SDI). That makes me sad on a camera, that otherwise seems to address most of the issues of the original. But perhaps the new 5" screen is really good, and bright enough to use outdoors. The 4/3 sensor leaves me a little torn too. Sure we'll be able to speedboost it back up to something approximating S35mm (and that's great). But a high quality, functional S16mm camera that could take advantage of compact S16mm glass would have been nice. I think SDI on a camera of this price point is, well, fairly pointless. The people buying this are more than likely going to be using HDMI monitors, since a descent SDI-based field monitor costs as much as the camera, where HDMI field monitors can be had for less than $200. IF you REALLY need SDI, there are HDMI to SDI converters that can be had for less than $100. I'm shocked we got what we got, and for this price. C4k is great, all the recording options are great, the built-in professional audio is amazing. Adding SDI to this would probably place it a little to close to the URSA for the marketing dept. comfort - and would also add to the cost, weight and ergonomics. Remember: The difference between this and the URSA pro is rather small. Sensors are almost the same size, less than 2-stops difference in DR, lack of built-in ND's. Add these, and you'd basically have the URSA - all for 1/5 the cost. But a high quality, functional S16mm camera that could take advantage of compact S16mm glass would have been nice. SDI is kinda a requirement to fit it into most workflows.. Yeah you can do a converter, but eh? And yeah an SDI Monitor may be expensive, unless, you know, you buy the black-magic recorders with SDI on them. Actually I wonder if those cross-convert. HDMI is really a crap connector, and I think most people would've happily paid a few hundred more for a better connector which would probably cost pennies to implement. I feel like with a pocket camera, an external monitor isn't even close to the first concern. Someone needing an SDI monitor isn't going to be using a pocket camera on a job, no? Sure you will; as a B cam/rigged cam, and wireless would be nice. And even for an EVF you have. already on other cameras and want to bring this out. Seriously, it's not like it's a major ask to have given an sdi or mini sdi port. What would it have really added cost wise? It would just help differentiate it more from the GH series. I never really understood this argument. Yes, it might well be a 'pocket camera' (although I think that was a bad naming choice for this camera --- maybe if you have a really large pocket), but why could it not just as easily be used an an A-camera? I'm betting more people will be using it as A-cameras than they will be as crash cams, 'pocket cameras', etc. Seriously, it's not like it's a major ask to have given an sdi or mini sdi port. What would it have really added cost wise? 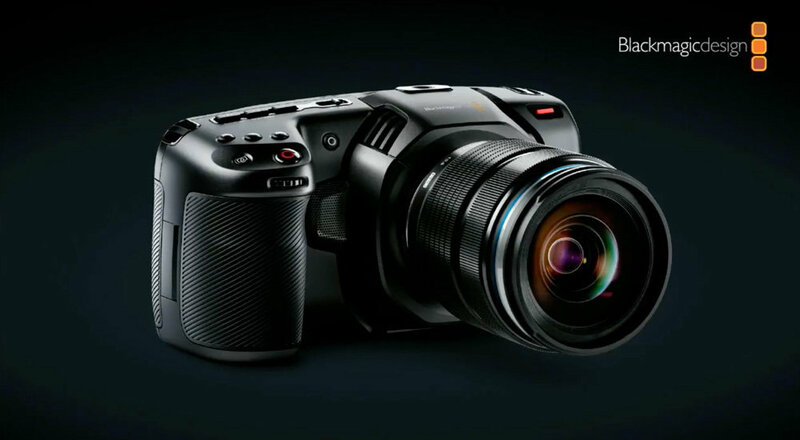 Well, my reasoning is that they could have put one in - but then that just brings this camera a further step closer to their URSA Mini Pro line, which I doubt they are wanting to do. There are a few things they could have added that would have cost little to no money, but camera manufacturers know that if you make your $1300 cameras close to as good as your $7000 camera, sales for the $7000 camera are going to be hurt. So my opinion is that the choice to exclude SDI was a choice they made based on protecting their URSA line. 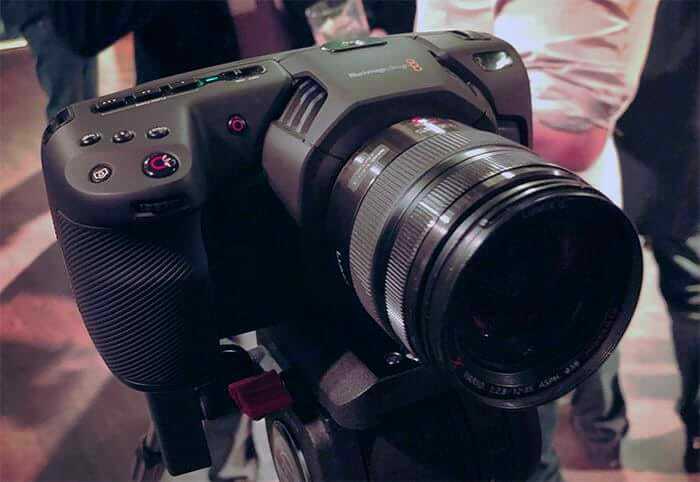 I mean heck, the Pocket 4K has some features even the URSA Pro doesn't have, and the real difference between the two cameras is actually getting really small - slightly smaller sensor, maybe 2 stops less DR, a few less professional connections and lack of ND's. I'm still shocked this thing is only $1300. Plus, that I/O panel already looks really crowded... Adding an SDI would mean it would need to be redesigned or something in there removed. I'd much rather their be an HDMI option than no HDMI and only SDI option on a camera of this cost.